I opened my rather clutered inbox this morning to see several notifications to sign petitions on the Change.org website concerning stores being opened on Thanksgiving day. There is one for JCPenney, Target, Macy’s, KMart, Woodbury Commons, Simon Premium Outlets, Walgreens, individual malls are called out and several general “Close Thanksgiving” in case you missed the idea. We have gone through this Thursday shopping argument every year now for at least the past 3 to 4 years. All the same arguments and yet the stores continue to open. 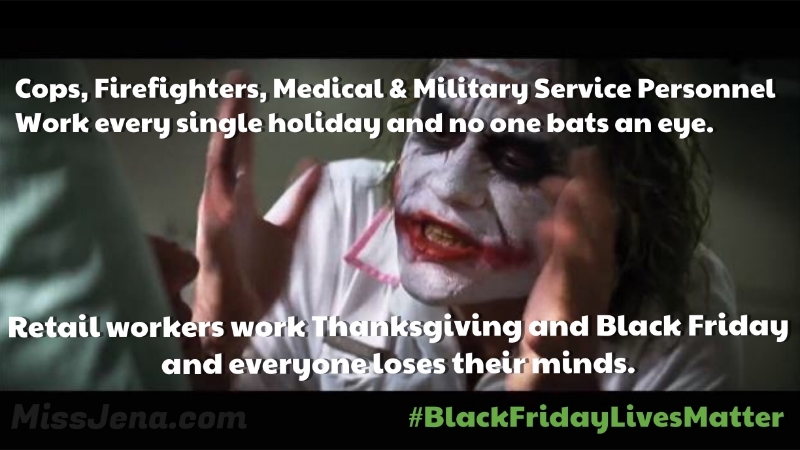 Here is my issue with Black Friday creeping up on Thanksgiving. As a military veteran who has worked on holidays like Thanksgiving and Christmas and been away from my family; celebrated Christmas the day before, the day after – BY MAIL, sorry not sorry. Do blog hashtags work? #sorrynotsorry – probably not, but I want to reinterate the point. I have a hard time understanding why retail workers wants are put above service workers like cops, nurses and military members. There are so many professionals who work every holiday. There are families out there that don’t even know what it is like to actually celebrate Thanksgiving on Thanksgiving because mom or dad is always working that day. Do you care? No, because it benefits you, but does not effect you directly. What does it matter if you celebrate one day or another? Families in these service industries know that changing the day your cook a big meal and celebrate with family doesn’t change the happiness. I understand shopping is not a need; it is fun and profit driven, but I enjoy going shopping on Thanksgiving with my family and knocking out all my shopping for the holidays in one glorious night of shopping frivolity. I would be willing to bet, that most people enjoy knowing that when they choke on a Thanksgiving turkey, that there is a doctor and nurse ready to assist you. The hospital staff – like retail workers – DO NOT HAVE TO BE THERE! They were not forced to be in the medical field. They were not forced to work at the hospital and they could have even chosen not to work Thanksgiving. Sure, they might get fired, but that is their individual choice. Retail and culinary industries and their respective workers are exactly the same. Military members are the exception. You sign away your life for those years and do what you are told when you are told. But please tell me why retail workers’ holiday and family trump military members’? It all started when I was a single mom on a tight budget looking to create a fun, exciting Christmas morning for my young daughter on a budget of next to nothing. I never knew about Black Friday, but here’s this deal at 4am. Are you kidding me? Didn’t even make it that year. After cooking all day Thursday starting early in the morning, a 3am wake up call just wasn’t happening. The next year I learned Michael’s was open at 6pm and the main stores started without much notice at 12am and it was awesome. Michael’s was nice and I was able to get all my decorations for less than a third of what it would have cost me on any other day with normal coupons and sales. My aunt and I swept through the main stores in 4 hours with most all of our shopping done. As a single mom struggling financially, I seriously nearly cried for the Christmas that I was able to provide my daughter on the budget I had available to me. Let’s get down to business. Target has the opportunity to earn a profit. The employees are paid or can choose not to work there. Why is this a thing year after year? Seriously, if you do not agree with the store’s actions, don’t work or shop there. If they lose more money on you not shopping there or can not hire enough talent to replace you – Thanksgiving day shopping will cease to exist. As long as people want to shop on Thanksgiving, those that disagree continue to shop throughout the year and employees still want the jobs that Target has available – Target is not going to change their policies and signing a petition is not going to change any corporate policies. But you’ll still shop at Target, people will continue to work there and they profit off both groups. Congratulations Target for Winning with Thanksgiving shopping. And do not get me started that these same employees crying that they have to work Thanksgiving day are the same ones demanding $15 an hour in pay. Act like a professional – get paid like a professional. The video below was from the 2011 Black Friday shopping at the WalMart in Dallas. My aunt and I weren’t even there to shop; just a lay over in between stores. I personally consider opening bell at WalMart too insane for me with products that just aren’t worth the battle or the long line. I happened to be about 8 1/2 months pregnant and we were hanging back in the empty clothing section watching the orc hordes claim their pray. Not all Black Friday or Thanksgiving shopping looks like WalMart. Target has seriously streamlined their shopping experience over the years, but I still prefer my personal favorites: Michael’s, Home Goods (formerly Garden Ridge), Neiman’s Last Call and Macy’s. On the flip side, this girl below is hilarious and on point. I feel an overwelming need to make a similar video, but she did it so well! Interested in hearing everyones thoughts on Black Friday and Thanksgiving shopping. Leave your thoughts, opinions and 2 cents below. This was a bit of a rant years in the making and I will calmly and slowly step off my rather destructed soap box now.